Notoriously foggy, noisy, and overcrowded, Lima is nevertheless an exciting and historic city, a place where many cultures and influences collide and the best of Peruvian culture, ancient and modern, can be enjoyed. A holiday in Lima may not sound a desirable prospect if one considers it is a city of about 10 million, most of them living in poverty and pollution. The metropolis was, however, once the pride of the Spanish colonialists and retains enough history and character to tantalise and charm tourists: there are some fascinating archaeological sites and museums to investigate in and around the city, and anybody interested in the history of Andean civilisations will relish exploring Lima. The vibrant nightlife is another good reason to travel to Lima. The jazzy neighbourhood of Miraflores and its numerous clubs and bars a big drawcard for night owls. Lima has decent shopping opportunities and a fabulous restaurant scene, showcasing the increasingly sought after Peruvian cuisine. The noisy, crowded city has some lovely open spaces, and the bohemian neighbourhood of Barranco, along with the historic old town, is fun to explore on foot. Lima tends to be hot and humid for most of the year, with little or no rain. The ideal months to travel to Lima are the least humid months, between March and April. From April through to December fog is common and blocks the sun. Read more on Lima's Climate and Weather. - Trace the history of Peru's ancient civilisations in the Museo de la Nacion. - Marvel at the golden treasures of the Museo de Oro del Peru. - Stroll around the Plaza Mayor and Plaza San Martin, the heart of Lima's historic old town. - See the Candelabra at Paracas National Reserve in Pisco. - Tour the catacombs and library of the Church of San Francisco, Lima's most spectacular church. - Explore the Museo Rafael Larco Herrera, which contains the most impressive ancient ceramic collection in South America. - Hike up Marcahuasi, a mountain outside Lima famous for its mysterious rock formations. - Fly over the famous Nazca Lines, one of the most thrilling and mysterious sights in South America. There are many fun and worthwhile excursions from Lima, and the city is the main transport hub of Peru, with regular flights and buses to the tourist centre of Cusco, and the southern attractions of Arequipa and Lake Titicaca. Jorge Chavez International Airport, situated 10 miles (16km) northwest of Lima, is Peru's main airport, with direct flights to several European and American cities. Get more information on Airports in Lima. - Lima is the second largest desert capital in the world, after Cairo. - It almost never rains in Lima; a half-hearted drizzle is all the city ever gets. - Lima is plagued by traffic jams and rush hour can be an experience. Positioned halfway down the dry and dusty desert coastline of Peru, the city of Lima is hemmed in by the Pacific Ocean on the one side and the foothills of the Andes mountain range on the other. A sprawling and chaotic place, the capital of Peru is overcrowded, polluted, and noisy, but it is also a colourful and vibrant city. The stark contrast between poverty and wealth is most visible in the miles of dusty shantytowns that stretch along the coast on either side of the city, and the glitzy apartment and office buildings of the affluent seaside suburbs. During the days of Spanish colonial rule the city was regarded as the most important and prosperous city in Spanish America and was the finest in the region, known as 'The City of Kings'. Today the splendour may have paled, but Lima is still an animated and bustling city with an exciting mix of nationalities and influences; a city crammed with culture, a rich heritage, and 10 million people. 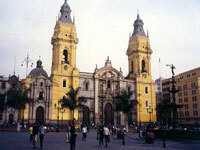 Lima dominates the country's political and commercial life and is the major gateway to the rest of the country. The city retains some of its original charm and has much to offer the visitor. Some of Peru's best museums, restaurants and nightlife are here, and the old colonial centre holds a certain elegance with its beautiful churches and convents, graceful old mansions, central plazas, and classic colonial-style buildings. The outstanding art and archaeology museums provide an excellent introduction to the history and culture that visitors will come across in other parts of the country.